I have a bunch of telephone books lying around the house. I don’t know how this happens - we don’t have a land line! We’re a cell phone as home phone family. I figure I could do one of two things with those phone books. Complain about them – which isn’t very productive and not really worth the energy. I wanted a new wreath for the door to celebrate spring. I had a wreath form from a failed project. 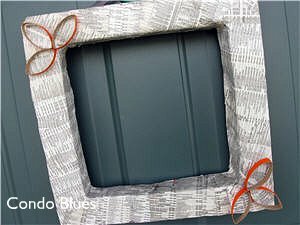 "What if I married my telephone books and my wreath form it would be the perfect project to enter in Dollar Store Crafts April Stash Bust Challenge?" says I. Not to mention it's an ultra cheap - and green! - way to get a new door decoration because I’m using what I already have on hand. I opened the wreath storage bag and found this. Once upon a time this was all in one piece. I decided to try to piece the form back together. If I got something workable I’d move on from there. If not, I’d ditch it and hop on down to the store and buy a new wreath form. I removed the Christmas balls with a pair of needle nose pliers and put them aside for another day. Can this wreath be saved? 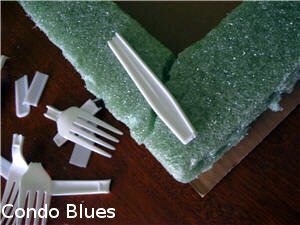 I snapped the tops off of some plastic forks that have been wallowing in the utility closet so long they are practically family heirlooms. I used them as supports to hot glue the form back together. Trash or treasure to be? 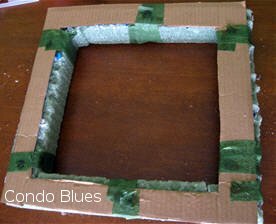 I cut a piece of leftover cardboard from I don’t-know-what to the size of the frame to stabilize it. 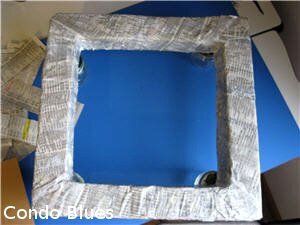 I attached the cardboard to the chewed up side of the Styrofoam with hot glue and floral tape. I think the floral tape might be from when I did the flowers for Christina from A Mommy’s Story’s wedding. I hot glued the floral tape into place because it wasn’t sticky anymore. I also made a note to use more of this stuff up because the floral tape has to be a least 6 years old – older than Christina’s kids. The Power Cutter came in handy when cutting the cardboard. I stand corrected on it's usefulness. 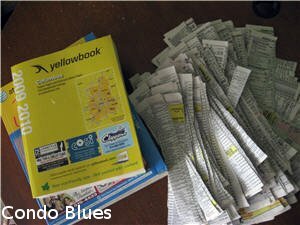 I ripped the white pages from the telephone book into approximately one inch strips. I used the business white pages because I wanted black and white paper. I tried to rip down the telephone number columns of the page for privacy’s sake. I shredded the leftover paper scraps and put them in my compost bin. I used by very good friend Modge Podge to attach the paper strips to the wreath form and let it dry over night. The Modge Podge will also protect the paper from the elements. The Modge Podge is leftover from my books as wallpaper bathroom remodel. Is it just me or is this post playing out like an episode of Horders? Yipe! 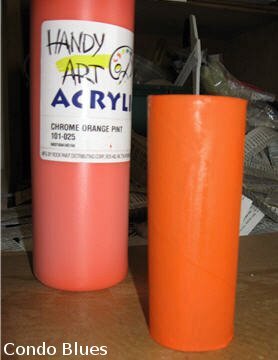 I painted an empty toilet paper tube orange as an homage to How about orange… and let it dry overnight too. Orange you going to say it's pretty? 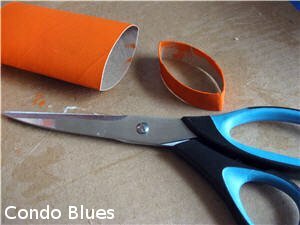 The next morning, I smashed the toilet paper roll tube flat and cut it with scissors. I eyeballed the cuts 'cuz I'm a rebel. I hot glued the leaf shaped rings to the wreath form and added some scrap ribbon to the back as a hanger upper thingie. TA DA! My telephone book and paper tube wreath idea actually worked! Yay me! What a neat idea! Very creative. awesome! I need a wreath for my door and this looks like fun!! thanks for the idea! I love this idea. I've seen wreaths were people use book pages; but I hate the idea of tearing up perfectly good books. But, I hadn't thought of phone books. Come on out here- I got enough phonebooks to keep you in crafts for a long time! You are so clever! And the way you persevered in saving your wreath form says alot about your creativity and personality. Love it! WOW!!! Incredible repurposing! Great job! This is so clever!! I love a good square wreath. Thanks for sharing!! What a terrific idea! I love it and may have to try it myself one day. You are a rebel with that square wreath! I designed a Spring mantelscape using burlap, jute and recycled Mtn Dew bottles over the weekend - I'd love for you to come see my post on that at sceneofthegrime.blogspot.com! Very interesting! What a great way to recycle those old telephone books, good job! That's actually pretty cool and i have not seen this before, Great job! I post everyday. come say hi when you can. Holy cow, girl, you are officially a genius! thanks for linking up. What a great idea! I love it! 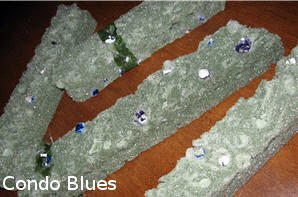 I'll be featuring it on my blog on Saturday! Thanks for linking up! What a great idea. 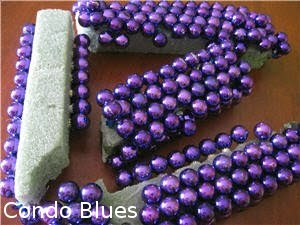 I love using everyday things to make decor! Cute! Found you through Dollar Store Crafts.